The next-generation USB Type-C has been defined by the USB-IF as an I/O connector specification for mobile phones, various PC, and imaging devices. “USB Type-C” is a trademark of USB-IF. 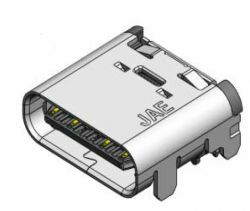 The USB Type-C specification connector features a reversible plug orientation that enables insertion and removal without minding front and back of the plug and supports SuperSpeed USB 10Gbps x2 communication and 5A max. power supply.